Oh that makes a great grad gift, love the colours you used! 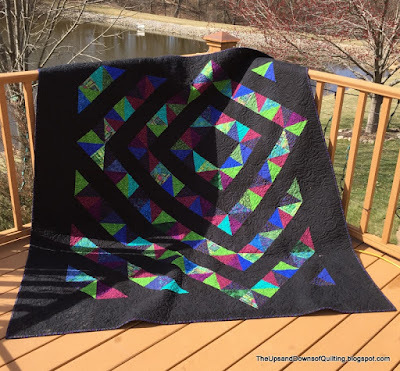 Thanks for sharing a link to my blog and tutorial, so glad you enjoyed making this quilt! Beautiful quilt and a lucky recipient. Congratulations to all of the graduates. Sounds like you have a busy year ahead. A stunning quilt which I'm sure will be treasured. Lots happening in your world right now for sure. Congratulations to the young folk on their successes. Living by the lake must be lovely. Spring can't be far away now. My goodness! Sounds like you've been busy, and will be for a while longer! No doubt the recepient of that gorgeous quilt will be thrilled! Love the colors and the pattern. ---"Love"